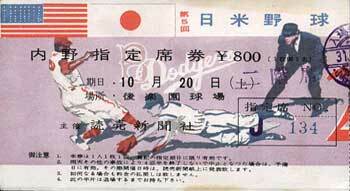 A team of MLB All-Stars is touring Japan and playing a team of Japanese All-Stars, the first such meeting since 2006. 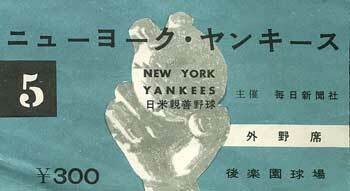 Goodwill tours by individual Major League teams were common in the years following World War II. 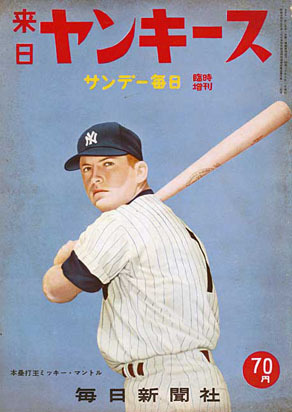 The New York Giants visited in 1953, followed by the New York Yankees two years later. The 1984 Baltimore Orioles were the last MLB club to make the trip. These goodwill tours were very popular in a postwar Japan that was in the midst of rebuilding itself into a major global economic power. It's no coincidence that the Giants' 1953 visit took place just a year after the end of the Allied occupation, which lasted from 1945 to 1952. The rise of a renewed consumer culture and the transition to an industrialized economy at this time gave birth to a distinctive Japanese style of graphic design, one which featured a blending of Eastern and Western influences and traditions. 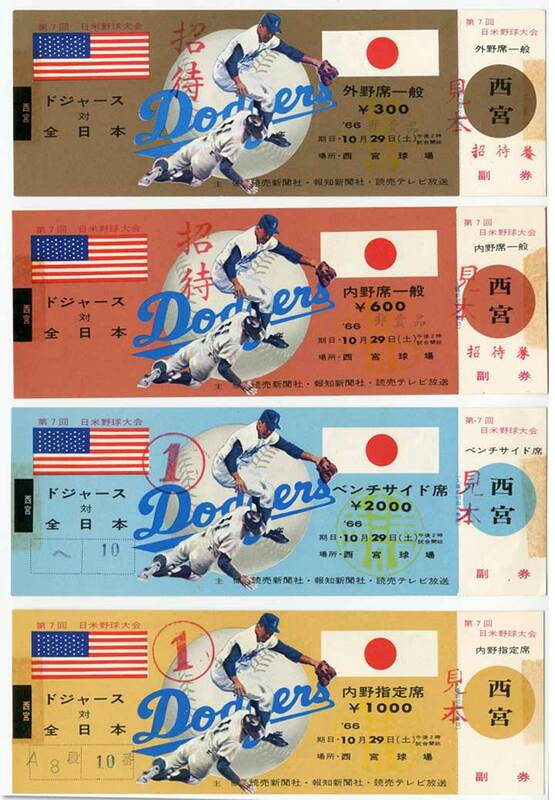 Japanese designers embraced the art of the poster—the perfect expression of this modern age. This also served as a practical way to reach consumers in a society that was witnessing rapid urbanization. The ticket and program designs from these tours are incredibly crafted. Eastern and Western letterforms are utilized in concert with highly stylized illustrations and expressive colors to create some of the most beautiful and memorable sports graphics ever seen. Enjoy.